I am a trader, fund manager, and strategy provider. By promoting Darwinex I only receive marketing for the DARWIN "BUX" that I offer there. Their community is very knowledgeable, experienced, savvy to investing in good strategies, and last but not least there are many moderators and those who take pride in keeping the discourse healthy and supportive of the goals of everyone. Which means giving out badges and the like for those who contribute healthy things to the forum and database of investable DARWIN's -- basically risk adjusted trading systems. I really like the feel over there, because they incentivise good behavior and good traders and savvy investors. Far less of selling investment crap and then running when everything blows up. Of course that happens to some extent everywhere, but far less of it is happening over there. The community forum and website have built-in functionality like social "likes" "shares" "quotes" "notifications" and the like. It feels a lot like some of the other most up-to-date social sites. Very convenient and facilitates discussion. 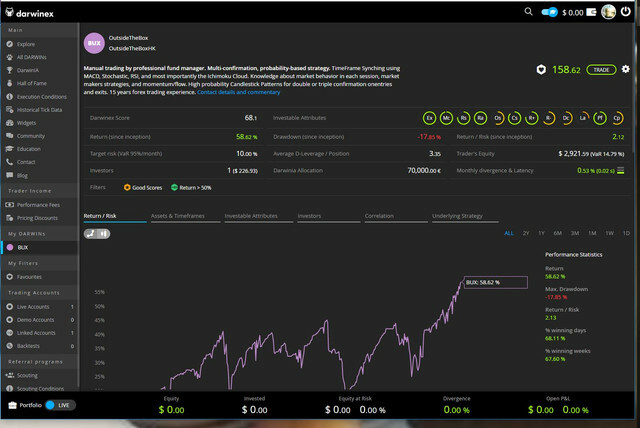 Most of all, many traders and investors have found Darwinex after being let down by Trade Copying and less experienced, less scrupulous strategy providers that you commonly find on less regulated and less professional sites. They came over to Darwinex because their platform displays many more KEY STATISTICS and assessments of how a trader/system behaves at certain times. The tools, sidebar, and navigation feel superior and faster, so everything is easier and helps you accomplish your goals in a better, smoother way. 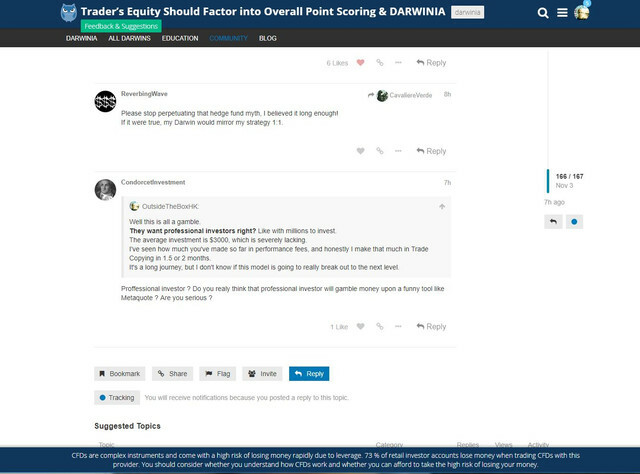 See below screenshots of the Forum and a normal User Interface when you are logged in and looking at a DARWIN.